The cardiovascular or circulatory system is an important organ system of your body as it makes the blood flow through the heart, so it can transport oxygen, hormones, carbon dioxide, blood cells and nutrients to and from your body cells for nourishing the body, helping it fight diseases, stabilizing pH and temperature and maintaining homeostasis.For all these activities to take place, it is important the heart blood flow remains smooth and constant. Let us find out more about it. Your blood flows via the heart in two individual loops. They are known as the right and left side loops. The left side of your heart is your left side and the right one is your right side. The right side gathers the deoxygenated blood coming from your body. It pumps it to your lungs where the carbon dioxide is released and oxygen is picked up. The left side then carries the fresh, oxygenated blood from your lungs to the heart’s left side. 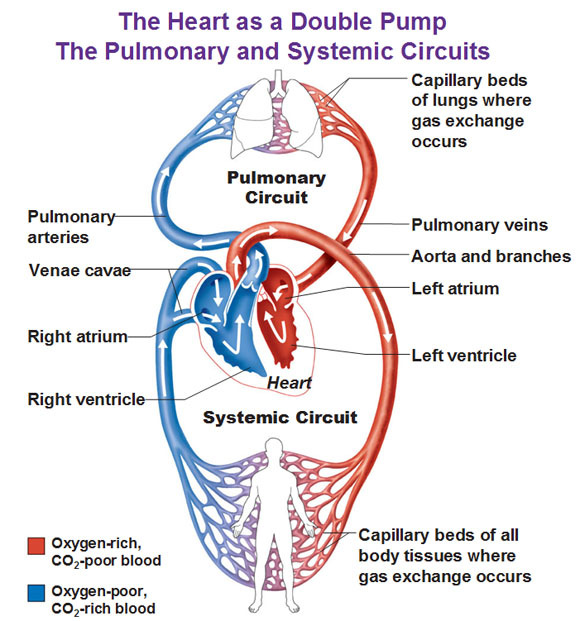 The left side pumps the oxygenated blood to your body. There are four chambers in your heart: two atria in the upper region and two ventricles in the lower region. Atria are thin-walled blood collecting chambers of your heart and they pump blood into your ventricles. Ventricles are chambers in the heart that gather blood from your atria and then pump the blood out. Deoxygenated blood enters your right atrium via the superior and inferior vena cavae. Blood then moves to your right ventricle which pumps your blood into your lungs via pulmonary arteries. In your lungs, carbon dioxide in the blood is replaced with oxygen. Pulmonary veins pump the fresh oxygenated blood once more to your heart and right in its left atrium. The blood is then transferred to your left ventricle that pumps it to your aorta that transfers the blood to the different body parts. Both the ventricles are stronger and thicker than the atria. The muscle surrounding your left ventricle is stronger and thicker than that encompassing your right ventricle because the left one is responsible for pumping the blood throughout your body, which is why it needs more force. The right ventricle has to only pump your blood to the lungs that doesn’t require much effort. There are two atrioventricular (AV) valves ascertain that the blood moves to the ventricles from your atria only. The valve on your heart’s right side in known as the ‘tricuspid’ valve and the valve on the heart’s left side is known as the ‘bicuspid’ or ‘mitral’ valve. There are two semilunar (SL) valves located in your arteries that leave your heart. They make sure that the blood doesn’t move to the ventricles from the arteries. The SL valve on your heart’s right is known as the ‘pulmonary’ valve as it connects to your pulmonary arteries. The SL valve on your heart’s left side is known as ‘aortic’ valve as it connects to your aorta. Now that you know of the basic process of how does blood flow through the heart, let us learn about the two main circulatory paths of your cardiovascular system: pulmonary and systemic circulation. Pulmonary circulation refers to the blood’s movement from your heart towards the lungs for its oxygenation and then moving back to your heart. Deoxygenated blood enters your right atrium via the inferior and superior vena cavae. Your blood gets pumped to your right ventricle via the tricuspid valve. The blood then moves to the pulmonary artery via your pulmonary valve. The big pulmonary artery divides into the left and right pulmonary arteries that travel to each of your two lungs. On reaching your lungs, the blood moves via the capillary beds resting on the numerous alveoli. Respiration takes place and carbon dioxide is removed from the blood and is replaced with oxygen. Alveoli are basically the tiny air sacs or pouches in your lungs that provide the surface needed for the exchange of gases. The fresh blood containing oxygen leaves your lungs via the pulmonary veins that return it to your left atrium. On reaching the left atrium, the pulmonary circulation becomes complete. Systemic circulation refers to the blood’s movement from your heart throughout the body to supply nutrients and oxygen to the body parts and bringing back the deoxygenated blood to your heart. Blood rich in oxygen leaves your lungs and enters your left atrium via the pulmonary veins. It is pumped to your left ventricle via your mitral valve. It then moves to the aorta via the aortic valve. Your aorta branches and splits into different arteries moving to your upper body and then passes through your diaphragm where these arteries further split into smaller arteries that supply oxygen saturated blood to your body’s lower parts. The arteries divide into many smaller arteries and arterioles and eventually turn into capillaries. Carbon dioxide and waste diffuse into your blood from the cells whereas the oxygen and nutrients in the blood move out of the blood to the cells. The oxygen depleted blood moves through your capillaries that merge together to form venules and then large veins. Eventually, the veins come together to form the big venae cavae that drains into your right atrium. The deoxygenated blood will then continue its pulmonary circulation to become rich with oxygen. The ventricles and atria work together and alternately relax and contract for making the blood flow through the heart. Your heart’s electrical system provides them the power for accomplishing this goal. The impulse begins in a little group of specialized and efficient cells known as the sinoatrial (SA) node situated in your right atrium. The SA node is also referred to as your heart’s pacemaker. The electrical impulse spreads via the walls of your atria, stimulating them to instantly contract. A group of cells lying in your heart’s center between your ventricles and atria known as the atrioventricular (AV) node works like a door that reduces the speed of the electrical impulse before it moves to the ventricles. This slight delay gives your atria enough time to quickly contract prior to the contraction of the ventricles. The ‘His-Purkinje’ network refers to a path of numerous fibers that send that electrical impulse to your ventricle’s muscular walls, triggering them to quickly contract. When you are resting, your heart beats about 50 to around 99 times per minute. Medications, emotions, fever and exercise can make your heart beat faster. At times, the heart can beat more than 100 beats/ minute.